Ah, the late 80s and early 90s. Days of vim and vigour. Of youth, fun and staying out past my bedtime. Oh the memories... *sighs*. Oh, that's right. One Day by David Nicholls. He of Starter for Ten fame. You know. The University-Challenge-in-the-80s story that was made into a film staring James McAvoy. 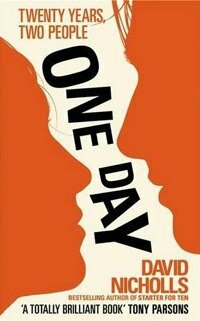 One Day charts the lives, loves and adventures of two friends from university: Emma and Dexter. Nicholls takes you back to visit them each year. Over a period of 20 years, we see them live their lives as friends, but always with the sense of 'what if...' between them. Neither Emma or Dexter are perfect. Nicholls is a master of painting a warts-and-all picture of personality. He's also a master of recreating moments in time. My favourite scenes remind me of when I first moved to London in the early nineties and lived near Brixton. And despite what I've suggested, it's not all rock and roll as there's a shock for you towards the end. I gather Anne Hathaway has been cast in the movie adaptation, about to start filming. I'm not sure I approve, but let's give her a chance. Hope there aren't any Rene Zellweger Bridget Jones' style accents going on.